Microsoft is getting into the kiosk business. Of course, because it's Microsoft, the company's kiosk introduction–called Surface–is wrapped in a welter of hype and hyperbole: Will it have the kind of impact that, say, the PC, cell phone, or Walkman had?! The mooing and braying over Microsoft's Surface system today is partly due to The Wall Street Journal hyping its own conference (translation: we need to make money on this show and so we have to hype it by "reporting" about it in our pages). That hype has had the effect of forcing every other outlet–yeah, including me–to write about the darn kiosk. Essentially, Surface is a table with a built-in computer that uses the table top as a touch screen. Not terribly useful for most things one might want to do with a table, but the company is insisting that Surface has world-altering implications. Okay, really all it has are some limited commercial applications: gambling games, shopping, etc. Okay, and Surface's touch screen does raise some hygiene issues, but that never stopped us from using the ATM. 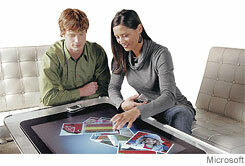 What Surface should have but does not: gesture recognition technology. This is something IBM has demonstrated many times over the years. Basically, gesture recognition uses video cameras and motion detection software to follow your hand movements. Just wave your hand in the air to have the screen wiped clean. Point to a picture and the computer opens the program for watching TV (or editing a photo or playing a song, etc.). You don't have to touch a thing. What else Surface should have but does not: voice recognition. Ask a question (How far is it to the theater? How much is the lobster special? ), and get an answer. That's what the waiter/concierge/whoever is there for. If the Surface can't accomplish the same task more efficiently, it's not of much use. 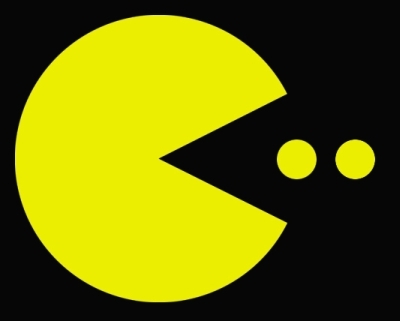 But for all its lack of pizzazz and technical prowess, there are some peole who might be impressed by Microsoft's Surface: anyone too young to remember playing Pac-man or Galaga on a table computer more than 25 years ago. This entry was posted in Uncategorized and tagged microsoft surface, quain, technology, touchscreen. Bookmark the permalink.